Pravda (Russian: Правда, "Truth") was a leading newspaper of the Soviet Union and an official organ of the Central Committee of the Communist Party between 1912 and 1991. The upcoming ABC special infomercial from the White House staring Obama and friends for socialized-medicine (and excluding all others) is a new high-water mark for the Pravdaization of the American major media. A free, open, fair and balanced news press has been vital to our national balance of power as implied by the description “the fourth estate”. Because of this history, our courts have even granted the press significant latitudes beyond the first amendment definitions. The major news media have indeed lost their professional compass and perspective and many are in financial distress, not because of the weak economy or bloggers or other forms of media. It’s because they have totally lost the journalistic concept that with power comes responsibility! Over time the majority of the Russian people (those not in The Party) came to not only reject Pravda but also to despise it. This process is unfolding in America and the worrisome issues are who and what will replace our old Fourth Estate? Obama declared to the Muslim world in Turkey on April 6, 2009 that America is not a Judeo-Christian Nation. More hope and change we can believe in? 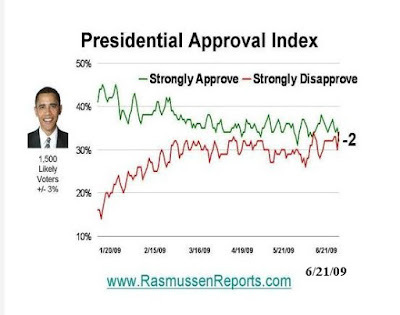 After one long year of the most endearing and intensive honeymoon between Obama and the major media, the reality of the Obama, Pelosi, Reid economic, social and political agendas are starting to be understood by the American people. Obama: N.Korea nuclear program poses "grave threat"
The President yesterday denounced the "extent of the fraud" and the "shocking" and "brutal" response of the Iranian regime to public demonstrations in Tehran these past four days. Can you imagine the number of American Jews who are having major buyers-remorse based on the last election investment of their money and votes? Where's Chuck Schumer now? Apparently Obama’s Appeasement speeches, his Ich bin ein Muslim speech in Cairo and his pathetic pandering with his “we are bad and you have a right to hate us” pronouncements are not working out well. What next? I just called to say I love you? The wheels are coming off the Obama-foreign-policy-wagon! Perhaps a good move and diversion would be a new election for Vice President: Biden vs Cheney. After what we’ve seen, would there be any doubt about the outcome? And the major left-wing media continues their pronouncements that Obama is heading in the right direction! What map, what GPS and what compass are these losers using? Talk about your Pied Piper and lemmings! Roanoke Times, 6/10/09, Pg 20: Editorial: Give stimulus time to work, recession was eight years in the making. The democrats and their liberal media associates are busy rewriting the economic history of the past nine years. Perhaps it would be prudent to look at the nine year economic index before extending the Obama administration spin beyond all fact and reality. One might also reflect on the government as the primary cause of the current financial crisis through congressional demands on Fannie-May and Freddy-Mac to loan billions of dollars in mortgages to people who couldn’t afford them. These “toxic assets” are still “on the books” with no resolution in sight. The facts are that the stimulus is NOT working and we are accelerating further into difficulty. Unemployment is over 9%. Foreclosures are still increasing; the government (taxpayers) indebtedness is astronomical and growing rapidly. GM is now in bankruptcy after $50 BILLION taxpayer money thrown away and dealerships and suppliers are falling off a cliff. The major issue with the “shovel ready” stimulus plan is just that – “shovel ready”. Of all the unemployed, how many run bulldozers, excavators, dump-trucks and jack-hammers? The focus should be on small business stimulation to create and grow private sector real long-term jobs. That’s not being done because the AFLCIO and UAW and other unions may not collect their pay-back from the last election. It’s also not being done because the team of Obama, Pelosi and Reid are determined to use the crisis to drive the country into a European-socialist economic model that suits their philosophy and cultural vision. Yet more hope and change we can believe in! Roanoke Times, 6/16/09, Pg 5: Three kidnapped women found mutilated and slain by al-Qaida in San’a Yemen. Two were German nurses and a South Korean teacher. Also missing are a German doctor, his wife and their three children. How could this have happened following Obama’s “Ich bin ein Muslim” Cairo speech that was advertised as being embraced by the radical Muslims who now are supposed to understand that we are nice people and their friends and we’re not at war with them anymore. That was just a Bush thing! The nativity of our new leaders is difficult to comprehend and will prove to be like the often repeated processes of appeasement throughout world history. Roanoke Times, 6/15/09, Pg 1, 14: Va Senator Mark Warner kicks off ObamaCare with law that will limit Medicare funding for late-in-life medical procedures. Not since Orwell’s 1984 has one coined such double-speak! American’s in general and senior citizen’s specifically don’t need Obama, Warner or the editors of the Roanoke Times to pass laws telling us and our doctors what their medical care should or shouldn’t be! We don’t need rationing or mandated restrictions; we need freedom of choice and an inviolate patient-doctor relationship that is immune to both government bureaucrats and ambulance-chasing-lawyers. All we really need is for Congress to enact reasonable and prudent limits on lawsuits and litigation so that hospitals and doctors do not have to continue to practice “preventative-lawsuit-medicine” and also pay tremendous liability insurance premiums that are passed on to the public! That is the central core of our medical care and cost problems; however, the-in-charge democrat party is in the trial-lawyer’s pockets and are not about to bite the hand that feeds them. In their view it’s much better to socialize medicine so that the new medical waiting room can be an extension of the motor vehicle office with all the associated implications. The guy who would be president, invented the internet and discovered that we have left the little ice age and are in 250 years of natural global warming has outdone himself. Gores holding company, INdTV, owns “Current TV” an independent media company. In March 2009, two of Gores media employees, Euna Lee and Laura Ling, were arrested by the North Korean’s for entering their country illegally. On June 8 they were found guilty of illegal entry and committing "hostile acts against the DPRK and subsequently sentenced to twelve years of hard labor. In the middle of all this, North Korea has been setting off nuclear weapons and firing long range missiles and threatening all people with white-skin and oval-eyes. Now would be a good time for Gore to do the honorable thing that Capt. Richard Phillips' of the Maersk Alabama did, trade himself as a hostage in exchange for his two female employees! This act would show what a caring and responsible southern gentleman Gore is and at the same time save the world from more of his misdirected activities for the next 12 years. Some are using the old and much maligned Mussolini-Fascism term that some define as a political theory advocating an authoritarian hierarchical government (as opposed to democracy or liberalism) and that historically focused on government-run industry and minimization of profit-driven competitive systems. Historically America has shunned this approach except in times of crisis as when Harry Truman took over (nationalized) the steel industry to break the steel workers strike during WW2. Perhaps our major media, and The Roanoke Times, could sponsor a public contest in which all could submit candidate names for the new system; something like Virginia has tried to do for its new state song. As an aside, it’s not clear to me what portions of the Constitution support government nationalization of private industry and corporations and companies. Didn't the Supreme Court rule in Youngstown Sheet & Tube Co. v. Sawyer that nationalization of private industry in not OK! This week David Gutter-mouth Letterman chose to highlight his monologue with a disgusting rant focused on Alaska Governor Palin’s visit to NY and on her 14 year old daughter whom Letterman disparaged with a disgusting sick joke that she was sexually abused by a Yankee ball player. Compounding his gross misconduct was the laughter of the audience and the silence of major media, the NOW girls, and the editorial girls at the Roanoke Times. Apparently all these media folks who pretend to be keepers of civility and decorum are very politically selective when it comes to articulating their standards of decency and speaking out against this type of abuse directed at women and young girls. Roanoke Times, 6/7/09, Pg 16: Former NY health chief (Thomas Frieden) tapped (by Obama) to head agency (CDC). A heartwarming summary, with picture, of Frieden’s wonderful accomplishments in NY public health management and his challenges as the nation’s chief public health chief. NY HIV+AIDS pandemic at least three times worse than national rate and much higher than documented. Clearly Obama is promoting a public health official who has been complicit in not containing the awful HIV+AIDS pandemic. Frieden and NY government have refused to implement the public health systems that were developed over 100 years ago because of Typhoid Mary. Because of this malfeasance of refusing to implement the same processes and procedures that are used for all major communicable diseases, this pandemic will continue to destroy thousands of innocent lives. The ultimate obscenity is to specifically and officially exclude HIV+AIDS from the definition of sexually transmitted diseases (STD’s) and thereby negate the health systems that have been used in their containment. Covering-up the magnitude and extent of the pandemic by never listing AIDS as cause of death is a national public health system disgrace. Frieden’s promotion to head of CDC will ensure that this malfeasance will continue. How pathetic! Roanoke Times, 6/2/09, Pg 1: Obama: GM’s nationalization only short term. Obama gives Government 60% and Canada 12.5%. Nicely tucked away back on Pg 16: Obama gives GM an additional $30 BILLION for a running total of $50 BILLION and gives the UAW 17.5% of GM.Stockholders are wiped out and bondholders get 10%. And to think that the government is prosecuting Madoff for his ponzi scheme! $50 BILLION and now they go to bankruptcy! What was the $50 BILLION used for?Apparently to pay UAW workers not to make cars. Their reward: 17.5% of the company! What a deal! Sounds like Chavez and the oil company takeovers! GM has been on a straight line down from 45% market share in 1980 to 35% in 1992 to 28% in 2000 to 22% in 2008. Why didn’t the wonderful Bill Clinton team fix this when it went from 35% in 1992 to 28% in 2000; a time when the UAW forced GM to accept a contract giving them 90% pay when they weren’t building cars, a contract still in place! So here we are, with a new AMTRACK. A government owed business in which white house aids, senators and congressmen are going to determine, based on politics of course, what dealerships survive, what plants are to be operated and what future car designs should be. What a bargain for America. Toyota and Nissan meanwhile are doing what free-market enterprise companies are supposed to do: adapt, innovate, and focus on customer-centric products and service. Why didn’t we think of that? Roanoke Times, 6/2/09, Pg 3: Large Heading and five column large article: Suspect is jailed in shooting death of abortion doctor. Pg 6: Small heading and small single column article: Arrest made after soldier killed at recruiting center. June 3, Pg 5: Almost entire page: Obama’s speech to trek rocky political terrain; The president on Thursday will address a Muslim world where distrust runs deep and credibility of the US is lacking. Thousands of Americans killed by radical-Muslims dating back to the early 1980’s culminating in the horrific 911 attack and the authors of this article and the editors of the Roanoke Times are concerned that the Muslims “distrust” us and that we have a lack of “credibility”! Reflecting on the Roanoke Times reporting of the two murders and the associated Obama response to them is also a clear measurement of the values and motivations of these two entities. A domestic-radical-Muslim shot two US soldiers outside an Army recruiting station in Little Rock Ark June 2, 09. One of the soldiers died from his wounds. Obama was busy getting ready for his trip to Egypt to kiss the feet of the Muslin world and inform them about all his Muslim background and connections. What an inconvenient time to express his sorrow for our loss! Not the case when a late-term-abortionist was shot and killed the prior day. That was seized upon as an opportunity for a national press-OP to express a strong message of outrage. What a true measure of Obama, the politician, making clear decisions about expressing dismay over the death of an abortionist vs. a young soldier serving his country, killed by one of our sworn enemies in our homeland on our city street. Another true measure of Obama’s dedication to our safety is GITMO. In spite of last weeks vote by both the House and Senate to NOT close GITMO and to NOT bring the GITMO detainees to the homeland, Obama held a new conference and ranted his distain for Congress and the American people and issued an edict that detainees will be brought here and that GITMO will close end of year! Much to the chagrin of Obama and Democrats and the liberal media, Americans believe, two to one, that GITMO should not close and that the detainees should stay there. They also believe that GITMO and water-boarding have added to our level of safety thereby siding with Chaney and not with Obama. The American people know that as soon as these detainees are brought here the ACLU will find liberal judges who will throw-out all charges and release them into our communities. The “OJ Dream Teams” and Judge Itos are easy to find! At that time Obama and friends will declare: “not my fault”! Perhaps Obama and his liberal supporters should start each day reading a brief summary of attacks upon Americas done primarily by the radical-Muslims he is embracing. This partial list all pre-date George Bush and 911. Apparently it’s not all Bush’s fault! April 1983: 17 dead at the U.S. embassy in Beirut.